If you are a regular reader of this blog then you might have guessed that Elliot likes dinosaurs a bit. Well, not just a bit - he is dinosaur crazy and has been since he was a toddler! 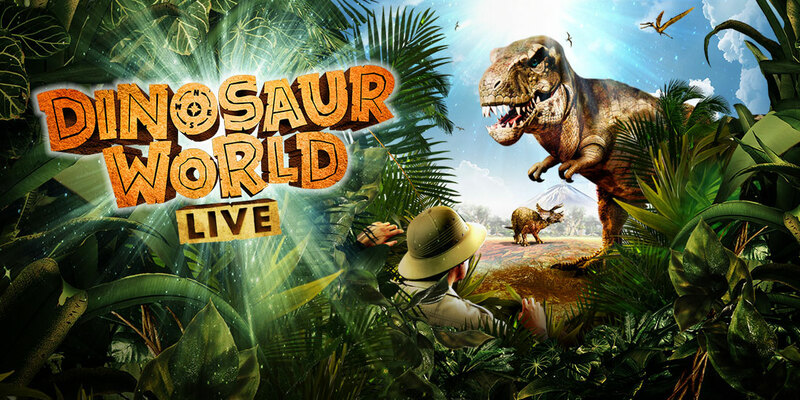 Recently, a show called Dinosaur World Live roared into our local theatre and I just knew we had to go! 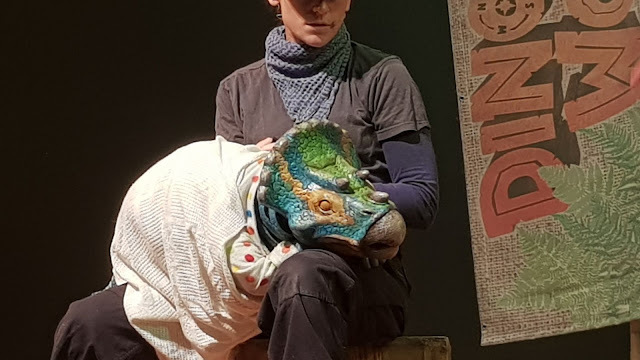 Suitable for all the family (3+), this interactive show introduces us to Miranda, who grew up on a remote island off the coast of South America where dinosaurs still roamed. Miranda was very bubbly and engaging and chatted to the audience about her parents who were palaeontologists and how she looks after the dinosaurs. 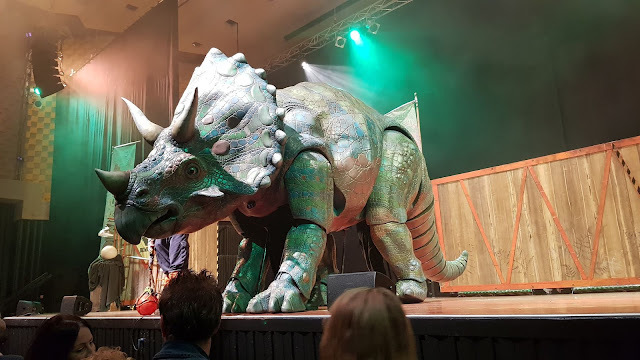 Throughout the show, the audience are introduced to 6 different dinosaurs, from little baby ones to big ginormous ones! You're probably wondering how on earth they got dinosaurs to go on tour but they are actually puppets. And very very clever puppets! Even though you can obviously see the cast controlling the puppets (complete with noises! ), they are so realistic and by the end of the show you almost don't see them as puppets. 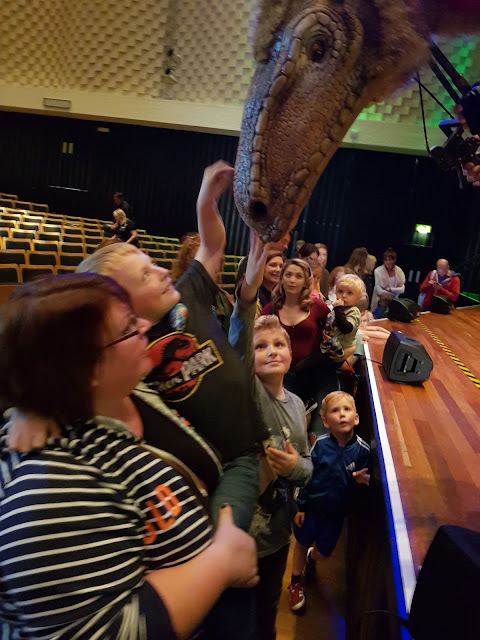 Children from the audience were invited to come up on stage and help look after the dinosaurs - feeding them, and even brushing them. Miranda did a great job at putting the kids to ease in what could have been an intimidating encounter! 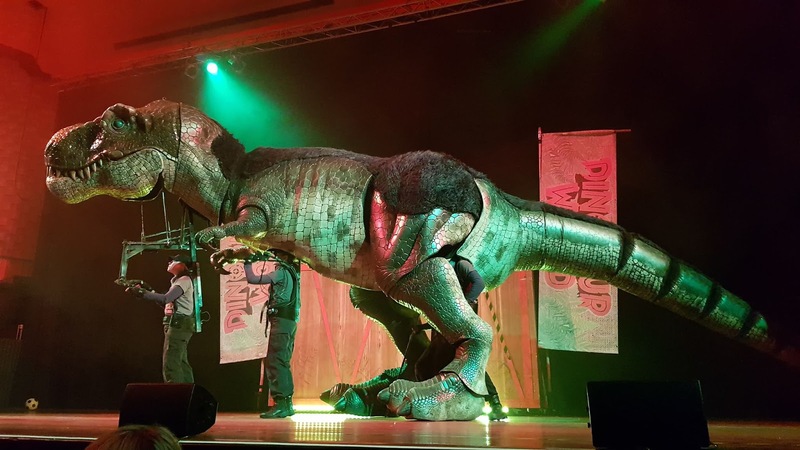 Our favourite moment was when Titus the T-Rex came out on stage - the lights dimmed, there was smoke...and a deafening roar! 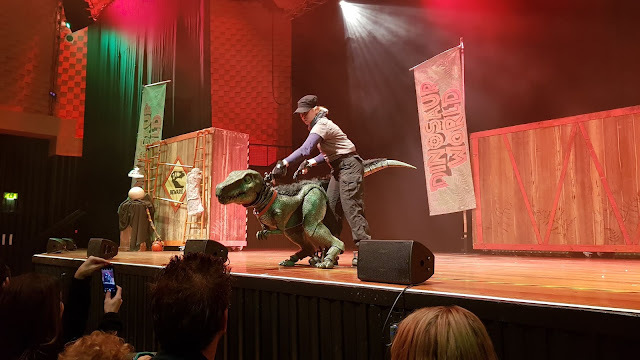 Elliot did jump out of skin at this part so I think it could be a bit scary for little ones - although our friends were sat nearer to the front of the stage and their baby thought it was hilarious! 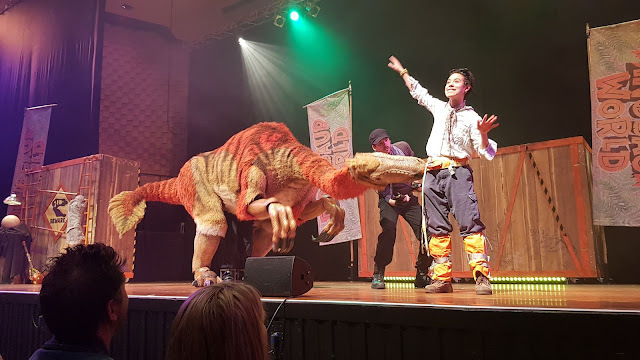 At the end of the show, the audience were invited to queue up along the stage for a special meet and greet with one of the dinosaurs. This could have been chaotic but actually everyone queued quite nicely and we didn't have to wait too long to get up close to the Segnosaurus! You could also meet the baby triceratops in the foyer which proved very popular. Overall we really enjoyed the show. At just under an hour it was the perfect length to keep children entertained and the perfect mix of facts and fun! 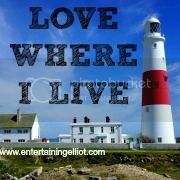 *A big thank you to my friends Liska and Andy for letting me use their photos - my phone died 2 minutes before the show began!